There will be a total solar eclipse happening in Cairns, Australia this year and similarly to the previous total solar eclipses (2008 and 2009), a small group of people from Europe are going there to observe it. This time we are 8 – Agnese, Anders, Emīls, Evija, Guna, Gunta, Ilgonis and Rūdolfs. As going the long way to Australia just for the eclipse would be a reason enough for but a couple of people, we have planned a roadtrip around half of this continent to see how that place at the world’s end look like. Solar eclipse in Australia will happen on very early morning of Wednesday, November 14th. It will also be partially visible in New Zealand and Chile. We expect to see it in Cairns where complete darkness will last for 2 minutes. The longest totality – 4 minutes fall in the middle of Pacific ocean again (East from New Zealand). To the right there is a map of the eclipse visibility. The light blue circle marks partial eclipse. The small black dot marks total eclipse. The time in the animation is UTC – at that point it’s already next morning in Australia. Interactive Google map with eclipse visibility times length and coordinates. We are going to Australia by plane, but the routes are different for each of us. Guna, Gunta, Ilgonis, Evija and Emīls are going from Riga, Latvia via London and various Asian cities, and returning the same way. Agnese and Rūdolfs are going from London and returning there. Anders is going from Sweden to Melbourne unlike the rest of us who will first see Australia in Sydney. He will travel for a week on his own before meeting the rest in Sydney in morning of the 29th of October. Emīls is also arriving there before the majority of travelers (evening of the 27th of Oct). 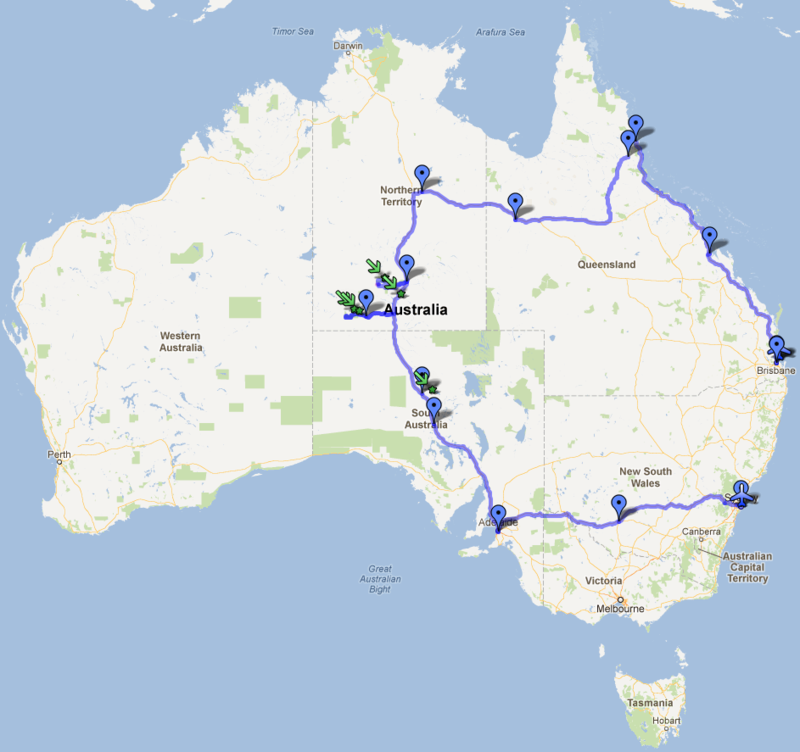 We will spend couple of days in Sydney, then take campervans and start our roadtrip around the country. You can see the route map below. The pins mark the places where we’d like to be in the end of each day. Of course, this is an optimistic plan. We will still be able to make it if we are a bit slower than this. As can be seen from the map, we finish our Australia exploring in Brisbane and return back to Europe from there (except for Evija, Emīls and also Rūdolfs, whose over-ocean flights depart from Sydney). You can click on the image to get an interactive Google map. In addition there will be another google map available that will get updated daily and will include all twitter updates placeholders. Just clickety-clicky here!